Szósty zestaw dodatkowy do tworzenia talii. • zasady gry w języku angielskim w pełnym kolorze. Erabus, the twisted spawn of old gods is free of his crystalline prison. The energy shards that once imprisoned him are now the only hope to stop a god bent on revenge. Without a champion to stand against Erabus, Vigil will fall. 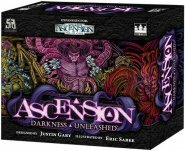 Playable as a stand-alone 2-player game, or combine it with Ascension: Rise of Vigil™ for an expanded game that can be played with up to 6 players!